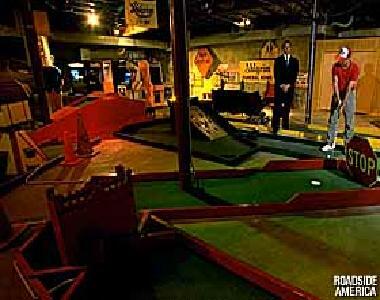 The most hair-raising miniature golf we've ever played is in the basement of a funeral home in suburban Chicago. The nine hole course, "Ahlgrim Acres," includes obstacles such as coffins and headstones, with a one stroke penalty for bypassing the coffin on Hole #2. Screams and spooky music play continually. A funeral director gives tips on conquering some of the tougher holes. Ahlgrim employees spoke about the futility of challenging the master of the course, Mr. Ahlgrim. "He's got the edge on everyone," confided one young funeral director. "He knows right where to hit the haunted house, that's the toughest one." 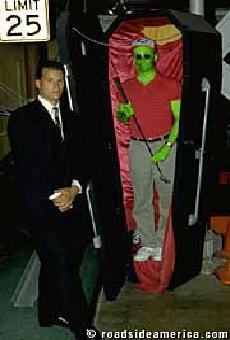 Miniature golf is offered by Ahlgrims as a standard part of their funeral package, and many take it. The course is used by local shriners to hold meetings and initiations, though anyone can play as long as a funeral isn't in progress. It's not all grim at Ahlgrims! Hours: Daily 9 am - 9 pm. Pre-arrange your "Fun Funeral" today!